August to October here in Mexico is our rainy season, it might not be the best time to come for a vacation, but it is definitely the best time to do our work at Tecoman turtle camp. 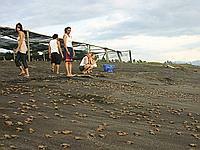 The summer is the time when Olive Ridley sea turtles come to Colima’s beaches to lay their eggs. They come ashore when the weather conditions are bad for their predators. During these months we prepare ourselves for the extra patrolling shifts on our 26km stretch of beach looking for turtles and their eggs. This is not an easy task. Economic factors in Mexico make turtle eggs an alternative for some locals who collect the eggs and sell them on the black market. Although poaching is illegal in isolated areas like Tecoman turtle camp it is difficult to catch the poachers. Every night at Tecoman turtle camp is a race between the poachers and us. High season means lots of work; non-stop patrolling of the beach, constant corral work, cleaning and making new nests. During this high season we collected more than 1400 nests. This year we have achieved an amazing birth rate of 86% that means if an average nest contains 100 eggs, 86 hatchlings will survive, that makes an amazing total of 120,400 hatchlings. When we find a nest we collect the eggs and take them back to the camp. The eggs are re-planted in a new nest in our specially made corral. It takes only 50 days for the eggs to hatch. The new born turtles then make their way to the surface and they are ready to go to the ocean. At the end of August we had the best night of the season, weather conditions were not very pleasant for us but wind, rain and heat all together, made for perfect conditions for Olive Ridleys to come ashore. Our volunteers patrolled the whole night, some by foot some other on the quad bikes. We managed to collect 100 nests in only one night. Once the nest has been collected we have few hours to re-plant the eggs in our corral because if we wait too long the eggs will become sterile. The work at the corral was frantic that night! By mid-October the volunteers saw the results of that special night in August. The 100 nests started to hatch and we had baby turtles literally everywhere. We collected every single miniature Olive Ridley and put them in buckets waiting until sunset when there are fewer predators in the ocean. The crocodile farm work is also getting more and more interesting. Last years “babies” are getting bigger and stronger and need special care. The younger offspring that came out this year are healthy and getting bigger. Our biodiversity study in the lagoon is soon to get very exciting as volunteers expect the arrival of many bird species on their winter migration. The lagoon holds the perfect combination of resources to host the avian visitors. All we need now is more volunteers to help with this work!